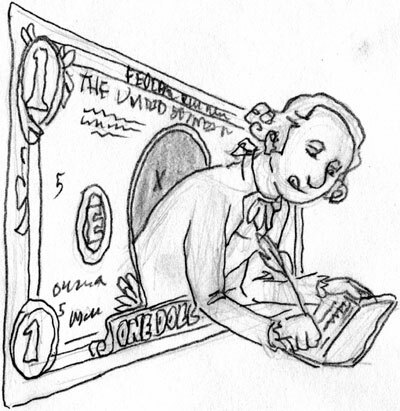 With George popping out of the dollar bill to sign a rent check, I thought it captured most of the elements of the story. 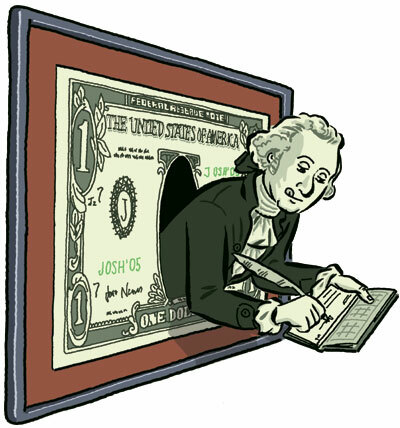 The art director liked it, but suggested adding a frame to the outline of the dollar bill, to drive home the point that the bill itself is art and not an actual dollar bill. 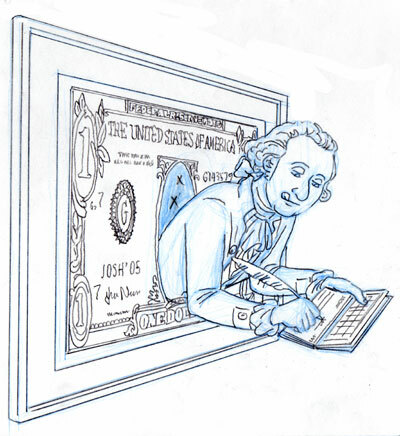 I also liked his idea because it takes the illo further away from the possibility of it being a commentary on, say, the national debt. And, voila! – a finished piece. All by 6 pm last night. One of your finer illos. Great stuff! Hey! What are you doing sitting around reading LiveJournal? You gotta get on the train for our lunch date! I’m riding my bike. See you there! I love seeing how work evolves, and how people do it. Thanks! Much appreciated. The concept is so weird: the guy actually pays his rent with his art! And all he does is pop art pix of George Washington? How many paintings by this guy does the landlord have?!?! Anyway, I thought this one was a particularly odd/interesting topic, and worth the process rundown. Yeah, that’s a nice illo and all, but we want to know about the now-developed George Corbett pics. Spill, dude!